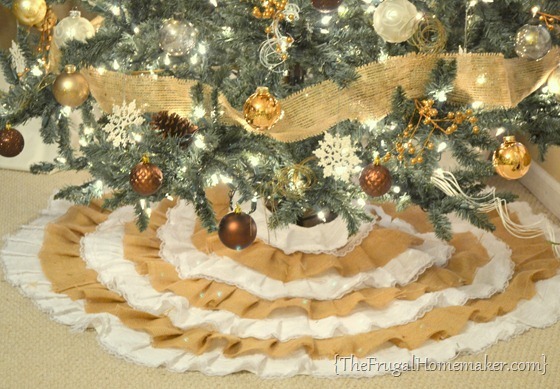 I am back today to show you how I made my tree skirt that I showed you in my Christmas tree post last week. 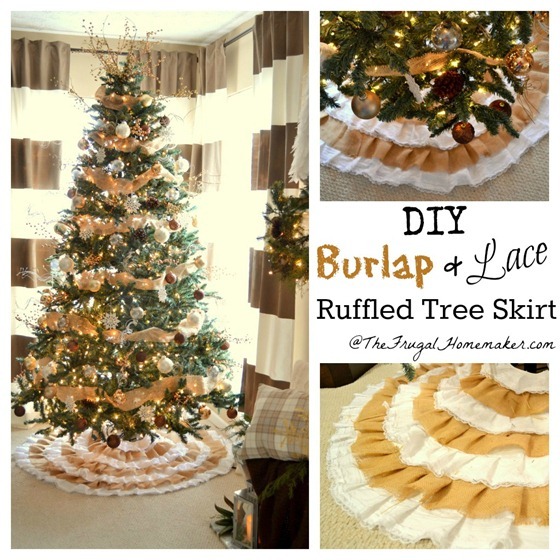 I am loving this tree skirt…. 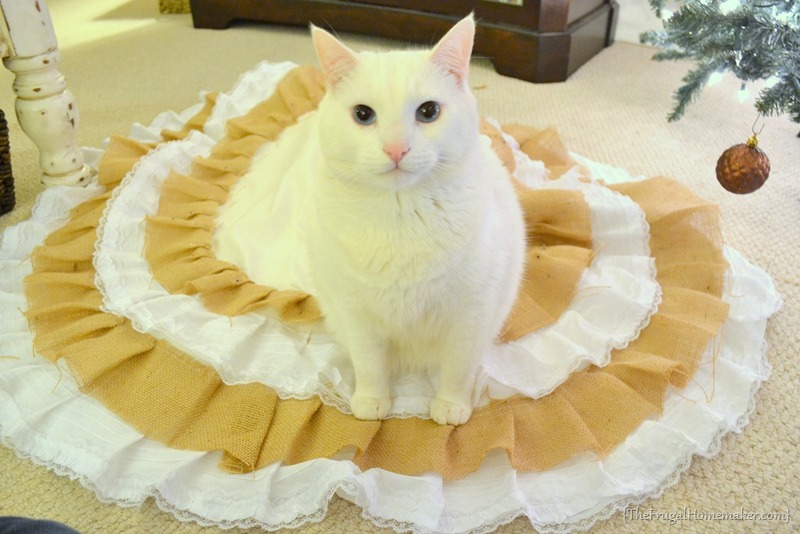 BUT, I am not sure that I will be making a ruffled one again. It was not hard, but it was time consuming. During Christmas, I time crafts or projects by Christmas movies and this was a 2-3 Christmas movie project spread out over several days. 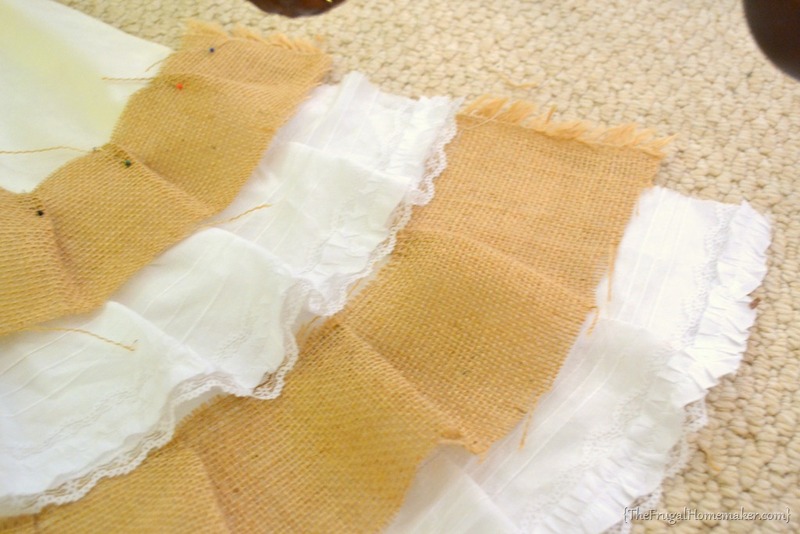 I started with a piece of white fabric. I used some of my fabric left from my painted curtains. 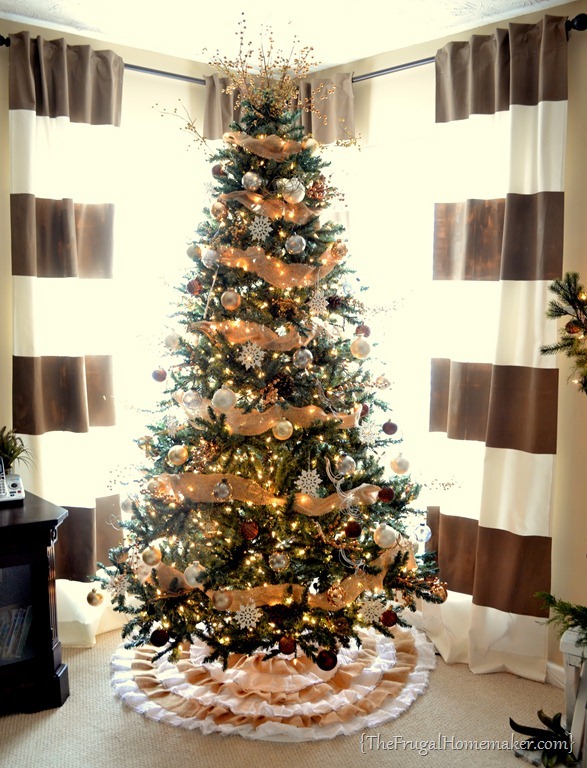 But you could use anything – a drop cloth, an old tree skirt, whatever. 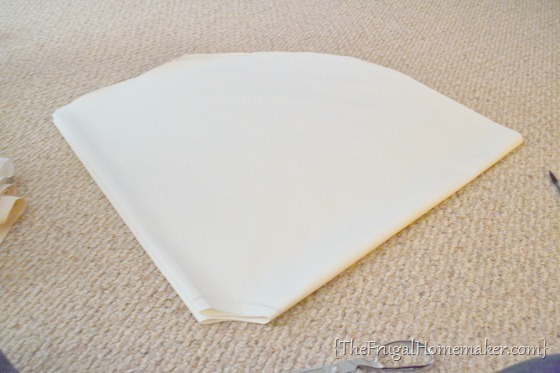 Cut a square and then fold it into fourths and round off your edges to form a circle. Also cut off the tip to form the middle circle that will go around the tree. Then open up and cut a slit from middle to edge. 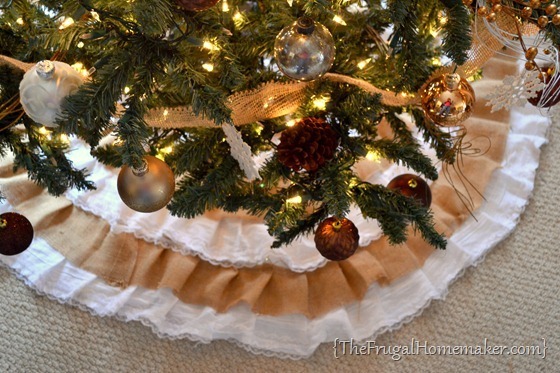 The dimensions of my tree skirt are 50 inches across and I have a 7.5 foot tall regular tree. For the fabric for the ruffles, I used burlap and lace. 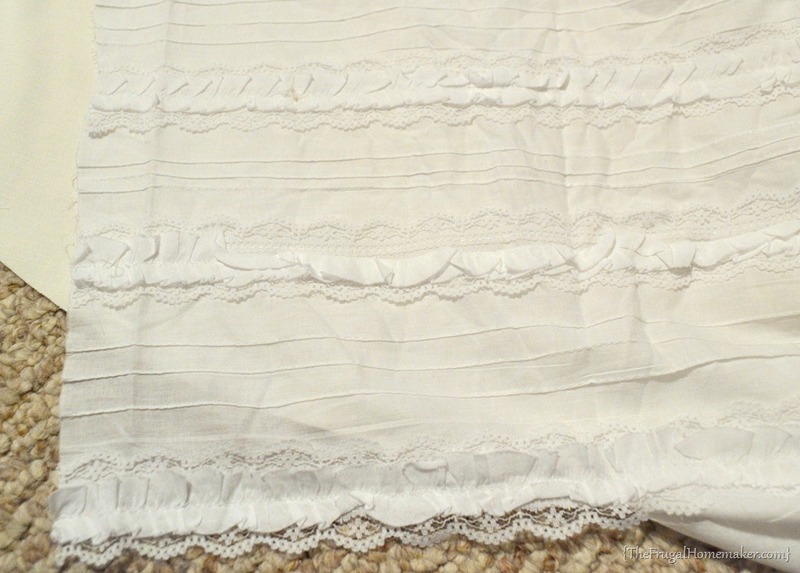 I picked up this fabric at Wal-mart and then cut strips of it by cutting it under each ruffled piece. It was about $5 a yard and I used 2 yards – I have several strips left too so you could maybe get away with 1.5 yards. This was much cheaper then buying pre-made lace. I used about 1.5 yards of burlap too. Now at this point if you want to make this a no-sew tree skirt, you totally can. 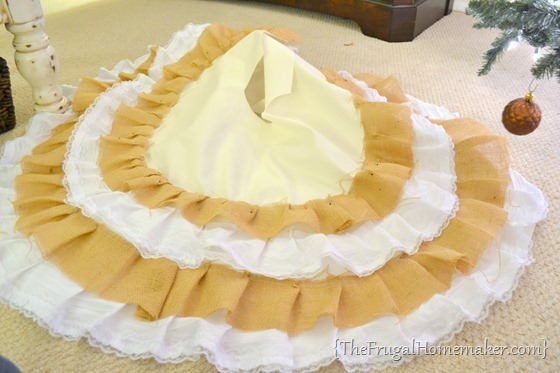 You can use hot glue or fabric glue to glue your ruffles into place. 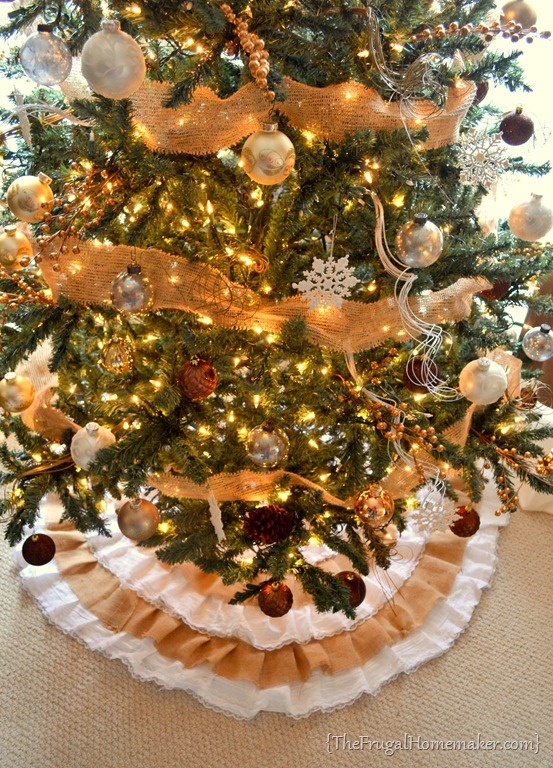 Check out these tutorials from Done over Décor and Muss Mustard Seed. Since my sewing machine was already out, I figured I would go ahead and sew mine. I wanted to be able to wash it, BUT I am not sure with the unfinished burlap if I would be able to do that anyways. 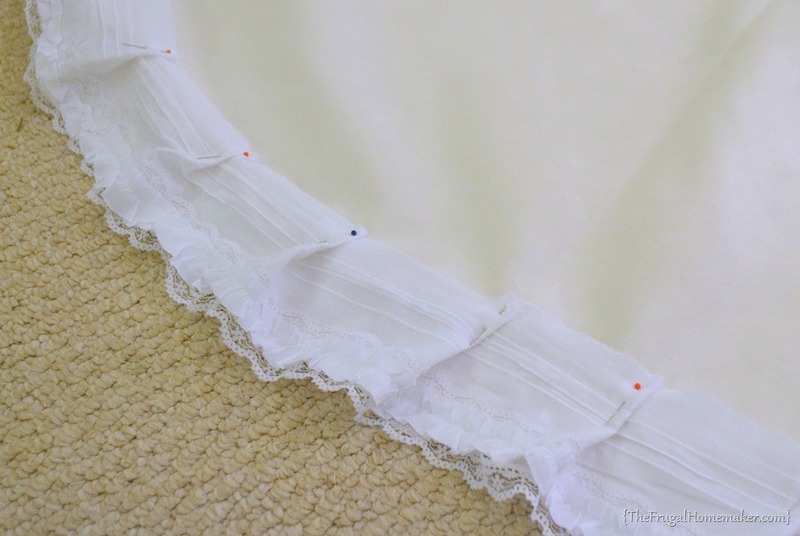 I started by pinning the lace pieces all the way around the skirt. I didn’t measure – just eyeballed it. 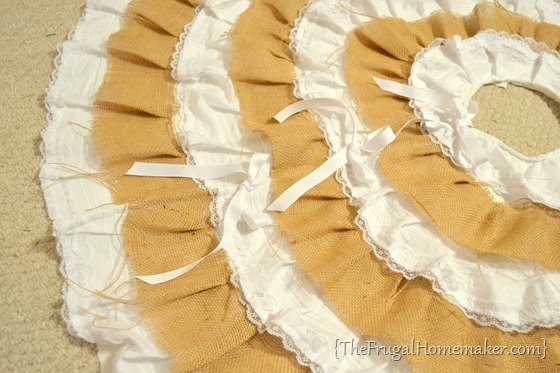 I would pin one layer of lace or burlap, sew it, then pin the next layer and sew it. I tried to make the ruffles on each layer be in the same place but once again, I didn’t measure and wasn’t worried about it being perfect. You won’t notice it at all when it was done. And the burlap I just left raw edges. They will unravel some and I am ok with that. I cut off any big strings but then just left it as is. Don’t worry, I had plenty of help! Finally done with all the ruffles! Then I turned the center circle and the edges in the slit under and sewed them for a nice seam. 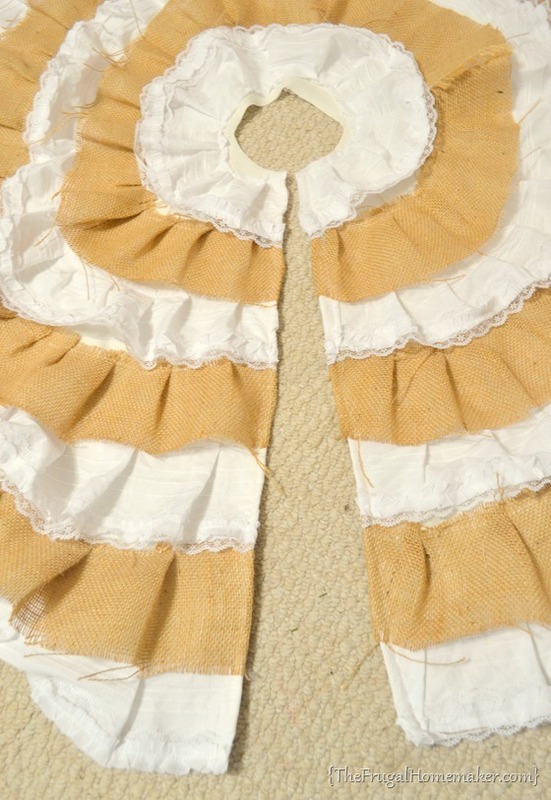 And added ribbon ties to close it. Love the bows too. Here it is under the tree! I LOVE it. Regardless of how long it took to make. Most of my projects/crafts are quick, so I enjoy doing some longer projects sometimes too. So would you make a ruffled tree skirt for your tree? What colors or fabrics would you choose? Just do a quick search on Pinterest and you will find some gorgeous ones – from red and white, to all burlap, or all white. Lots of options! 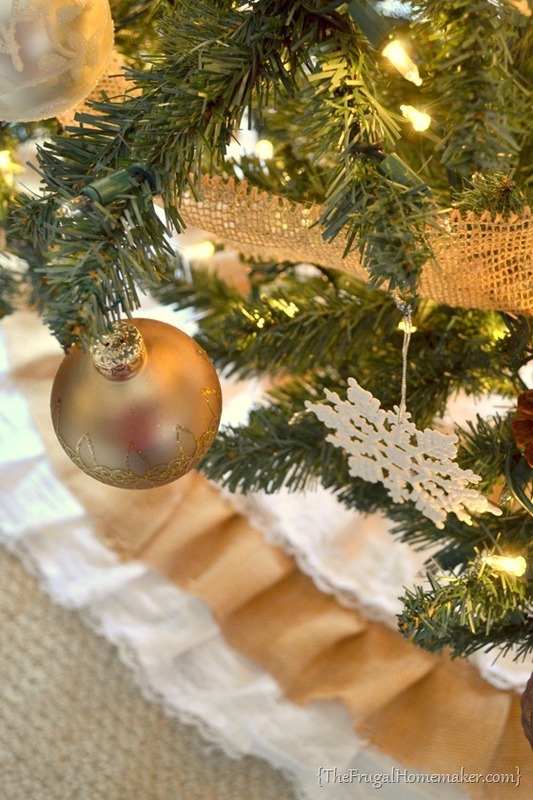 Don’t forget to link up to our Homemade Christmas linky party! Or just head over and check out some of the great projects that have been linked up. Hey, Christina, it is looking so pretty at your house! 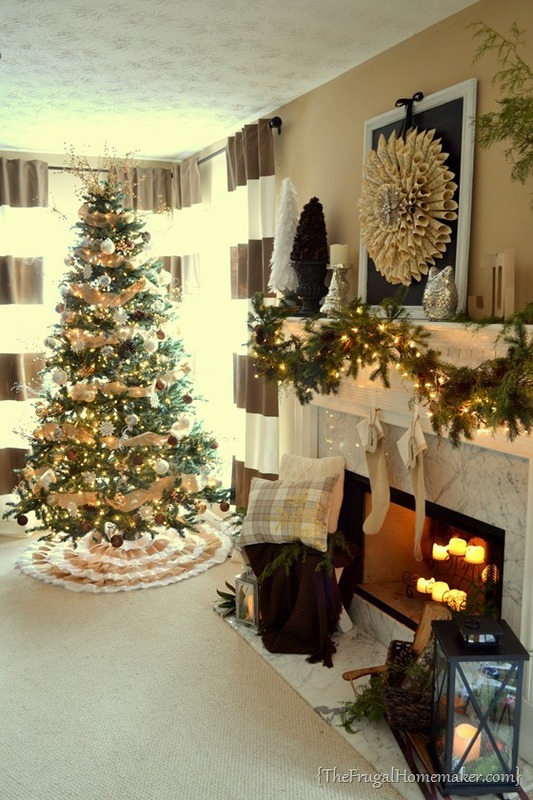 That tree skirt is SO wow, love it and how it accents your tree. Thanks always for stopping by. I hope you and yours have a wonderful Christmas this year. I love your tree!!! I’m also in love with your curtains and would love to add them to my home. Where did you find them? I’m wanting to make one of these for our tree this year and was wondering how much of the white fabric (base) should I order to get a circular shape going? Thanks for the tutorial! It came out beautiful!